Your wedding day is the most important day of your life. It is one that you have planned since you were old enough to daydream. As you near this day, the number of tiny details you have to deal with can seem a bit overwhelming. Now that you have dealt with finding the perfect wedding dress, picked the caterer, the flowers, the color scheme, the band or DJ, you probably think you are all set. But, have you stopped to think about the way in which you and your new spouse will walk out of the ceremony? Create one of the most dramatic exits by giving all of your guests wedding day sparklers to hold aloft as you walk out together arm in arm. Think back to the last wedding you attended - was it a friend or family member's wedding? Do you remember the happy couple's exit? Chances are you really don't remember it as being any different from any other weddings you attended. The guests were probably given either a bag of rice or confetti or a confetti cannon to shower the bride and groom with. Same old-fashioned boring send-off that has been in use for decades (confetti) or centuries (rice). By choosing wedding day sparklers for your exit, you are not only bucking tradition, you are setting the bar at a new height! If you have never seen wedding sparklers, they are just like those your kids play with on the 4th of July, only in most cases bigger. Wedding day sparklers come in three sizes, 10, 20, and 36-inches long. Each has a different burn time ranging from 45 seconds for the 10-inch ones to a full 3.5 minutes for the 36-inch variety. Your guests are sure to remember the way you and your spouse exited the building after the ceremony when they have taken part in showering you with golden sparks. Not Enough to Tempt You? If creating a dramatic wedding exit using sparklers is not quite enough to convince you they are a good idea, there are other styles you can add to your special day. You can also hand your guests heart-shaped wedding day sparklers to show them how much you love each other as you walk to the car on the way to your new life together. 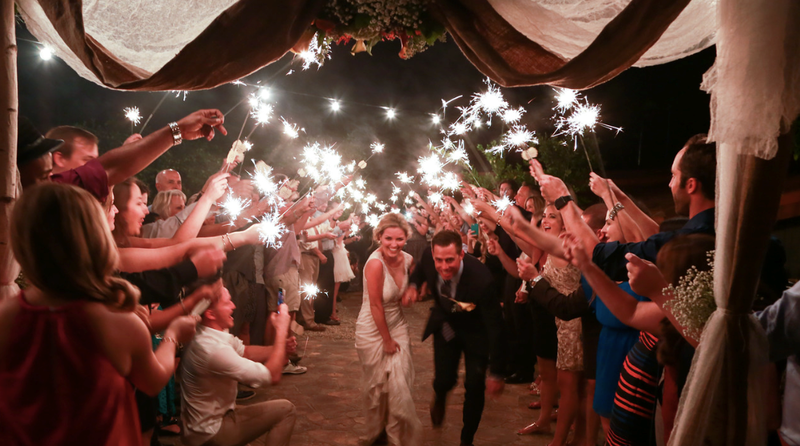 These wedding sparklers burn for 50 seconds and produce a shower of gold sparks that make for amazing night pictures. To make sure everyone gets a sparkler, add personalized tags on each one with your guests' names lovingly written on them. Wedding day sparklers are the perfect way to add a touch of flair and drama to your special day. Your guests are sure to remember your exit long after they have forgotten those that used rice or confetti. Check out WeddingSparklersOutlet.com for a fantastic selection of wedding day sparklers at amazing prices.